If there's one lesson I learned while putting this Oreo cheesecake together, it's that I have absolutely no patience. I was so keen to photograph it that it probably should have been in the freezer for a bit longer, but hey, it still tastes delicious! Every slice after this one had the perfect distribution of Oreo chunks, so it's basically the cheesecake that keeps on giving. I'm glad I decided to make this as nothing makes me happier than food photography, even though it should have looked 10x better than it does, but it has kickstarted my blog again so I'm pleased! Anyway, you can find the original No Bake Oreo Cheesecake recipe here with a cute serving idea of chocolate on the top too. I think it would look nice with crushed Oreo's all around the outside or maybe with mint Oreo's instead. Smother it in chocolate guys, go wild. Get a spring form pan ready. Combine the finely crushed Oreo's and the melted butter together, then press into the pan. In a bowl, whip the cream cheese until it's smooth. Add in the powdered/icing sugar and mix on high until thoroughly combined. In a separate bowl, whip the whipping cream until it's thick and fold this into the cream cheese mixture. Mix in the roughly chopped Oreo's then pour this into the spring form pan, smoothing out the top. Place the cheesecake in the freezer for at least 2 hours (4 hours or more is ideal, I did 3 and it was still soft), and remove to room temperature for 20-30 minutes before garnishing with additional whipped cream, chocolate sauce, and crushed Oreo cookies and serving. 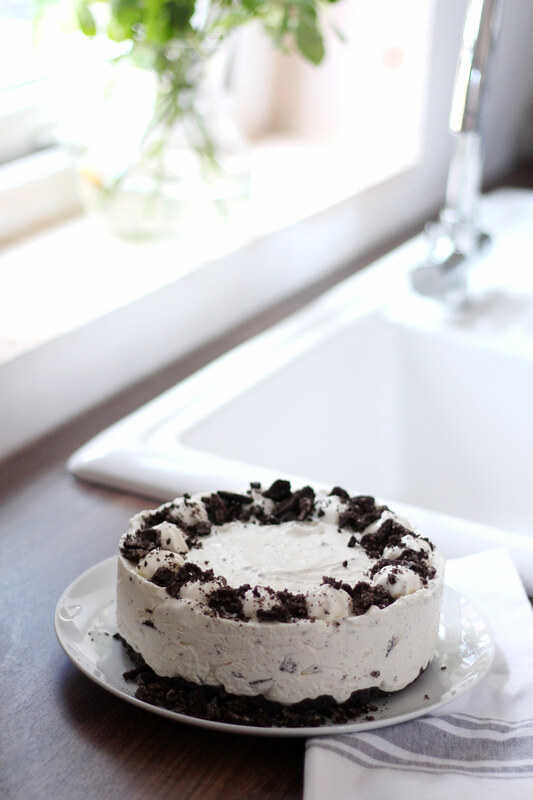 So there you have it, delicious no bake Oreo cheesecake which can be mixed together in about 15 minutes with minimal effort. It keeps for a couple of days in the fridge or a week in the freezer. I've kept ours in the freezer and we've been having slices each night which has been a bit of a treat! Phil really likes it still frozen as it's apparently like an ice cream and a cheesecake combined, but either way it's pretty darn good. Hope you enjoy it if you decide to make it!